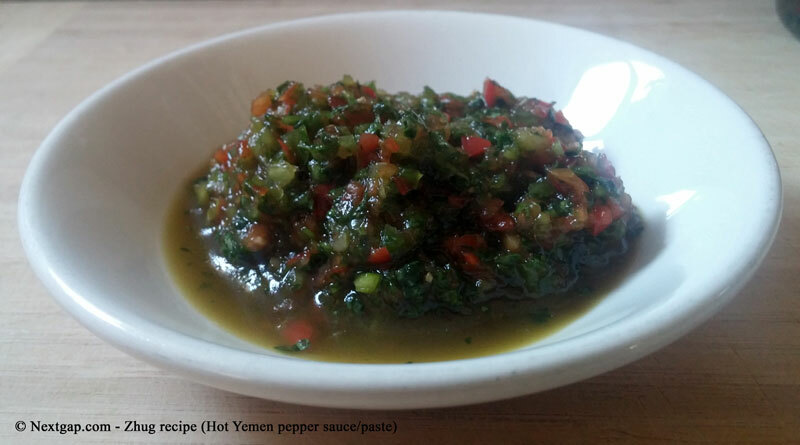 The other day I was making a Yemen pepper paste (“Zhug”) and the garlic I used left my hands smelling awful. The odur gets stuck and water and soap didn’t really help. I found out that rubbing my hands thoroughly with a tablespoon of salt and some lemon juice, completely deodorized my hands. 1 kg of green or red chilly peppers (or a mix of them) , cleaned from the white part (optional, but I think it gives better results)- Note, hot chilly pepper can burn the skin, use nylon/silicon gloves when cleaning and cutting the peppers. Put the coriander in a good food processor (don’t use a mixer!) , until it’s finely chopped. put the chopped coriander in a bowl. Put the peppers in the food processor and with the pulse button, chop it to a fine small texture but not a paste, it shouldn’t be watery. Add the chopped pepper to the chopped coriander. Add the black pepper, salt, olive oil, Clove and cumin. Mix it all together. Taste and correct the salt if needed. You can use a bit and freeze whats left in little containers.